Having a custom swimming pool is one of the best things in life, as millions of homeowners can testify. There are currently over 10.4 million residential pools in the United States according to the latest data that relies on the information submitted by custom pool contractors such as SoCal Custom Pools and Spas and compiled by experts at the Association of Pool & Spa Professionals. Furthermore, California is the most popular state for in-ground pool installations. But what about states with colder climates than California? Installing a heater to your custom swimming pool can give you a chance to use it more frequently throughout the year, including some colder months before and after the summer ends. Apart from that, it gives you a chance to use the swimming pool even in the night or early in the morning. Anybody who tried a morning swim can tell you that it’s more powerful and invigorating than a cup of coffee. Pool heating is not reserved to outdoor pools either. Even an indoor pool can benefit from it, as there’s not enough heat from the sunlight absorbed by the water indoors. But do you know how to choose the right heating system for your indoor or outdoor pool? In this article, we’ll give you some details that should help you choose a heating system for your pool. Before choosing the type of heater for your home pool you need to take several factors into account. For many homeowners, the first thing to consider is the price. The other major factor is the area where you live, more specifically its climate. Apart from that, there are other important things to consider. These include the size of your pool and any additional features you have installed. Some of the most popular features are jets and waterfalls and having those will influence your choice of a pool heater. Finally, you need to consider how often you plan on using the heating system and whether you have an outdoor or an indoor pool. Then you can decide from several types of heaters: solar, propane-powered or electric pool heater. 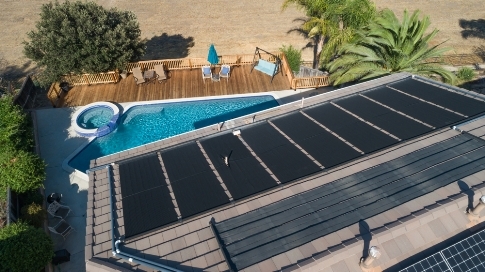 Solar Pool Heaters require a larger initial payment but are more sustainable and affordable in the long run. This comes from the fact that these heaters use the renewable power of the sun to heat up your water. This makes them incredibly inexpensive to maintain, as you won’t have to pay for the power source, only some maintenance, and repairs. However, solar panels are most efficient in states with a lot of sunlight. As they are ineffective during cloudy days, they are not a good idea in certain states with frequent clouds. However, not only are the best for your wallet, they are best for the environment as well. While this type of pool heaters is fairly inexpensive to purchase, they do require a lot of power to work. This means that you’ll be seeing a sizeable increase in your electric bill. Furthermore, they are more effective for smaller pools, making your choice fairly limited if you have a large, outdoor pool. These heaters are the most popular ones among pool owners. They are not too expensive to use and heat up the pool very fast. Therefore, they are not too expensive to use throughout the year. However, you will need to partner with a propane supplier to refuel your tank from time to time.